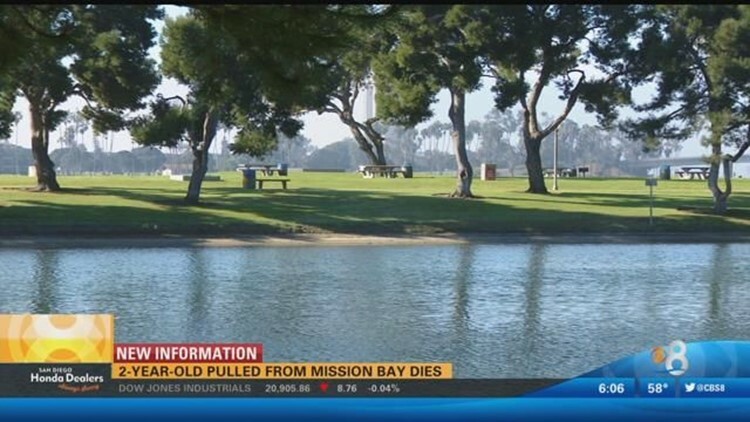 A two-year-old boy pulled from the water in Mission Bay has died. SAN DIEGO (CBS 8) - What was first said to be a near-drowning has now ended with the child's death. The little boy was pulled from the water on March 12 at a pond near Paradise Point. The medical examiner said the cause of death was drowning and his death has been ruled an accident. The boy was identified Tuesday as 19-month-old Farhan Salehi. CBS News 8's Shannon Handy spoke with a witness who tried to revive the child. Michael Valenciano said the toddler was lifeless and non-responsive when he checked him for breathing and a pulse. It is unclear how long the child was in the water, but Valenciano said it could have been several minutes or even hours. Following the incident there was a public disagreement between the Lifeguard Union and San Diego Fire-Rescue over dispatch procedures, with the union asserting there was a delay in responding to the call to help the child. San Diego Fire Chief Brian Fennessy said there was no delay. Valenciano said emergency personnel were on the scene within 10 – 15 minutes. The Lifeguard Union maintains that they were first on the scene despite being dispatched last. Responding paramedics transported the boy to UCSD Medical Center and then Rady's Children Hospital. He was declared dead on March 15.